They always say that grass never grows on a busy street. And boy, if that is the case…HIGS has been doing their part in proving that point. Within the past couple of weeks, we have added several new board members and will soon announce another exciting new venture that we are in the midst of planning and sorting out all the details. I keep telling people that “We are not your Grandmother’s genealogy society”. This is so true. And very shortly…you will see why. As most of you are aware, HIGS has a group page on Facebook. It is used as a forum, event planner, and photo archive. In the past year that we have been online, we have realized that our group’s page has become a very valuable tool. 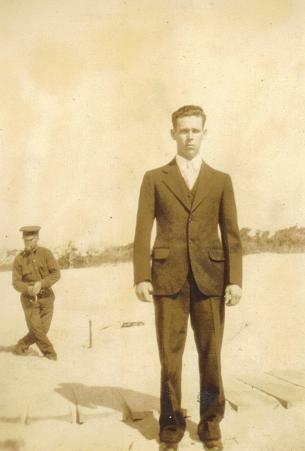 First, it has been a gathering place for those who are from, or had ancestors from, Hatteras Island. People share. People discuss. People connect. It is such an awesome thing. Just shows that today’s technology can be used in a very positive way. With over 480 group members…we stand as a testament to that. Lately though, with all the changes and projects that the HIGS Board Members, have found themselves facing…our online time has become limited. Just bare with us as we tidy things up and get organized, so that our members will soon be able to join in and truly become a more active and “hands on” society through the projects that we are planning. Hatteras Island Genealogical and Preservation Society, is in need of a Website Editor. This is a volunteer position where one would also be a member of our Executive Committee. They would need to know how to set up and maintain a website. Be able to set up interactive membership forms and an online store, complete with online payment options…such as Paypal. And to keep our HIGPS group on Facebook, active and up to date. Same for our regular site. 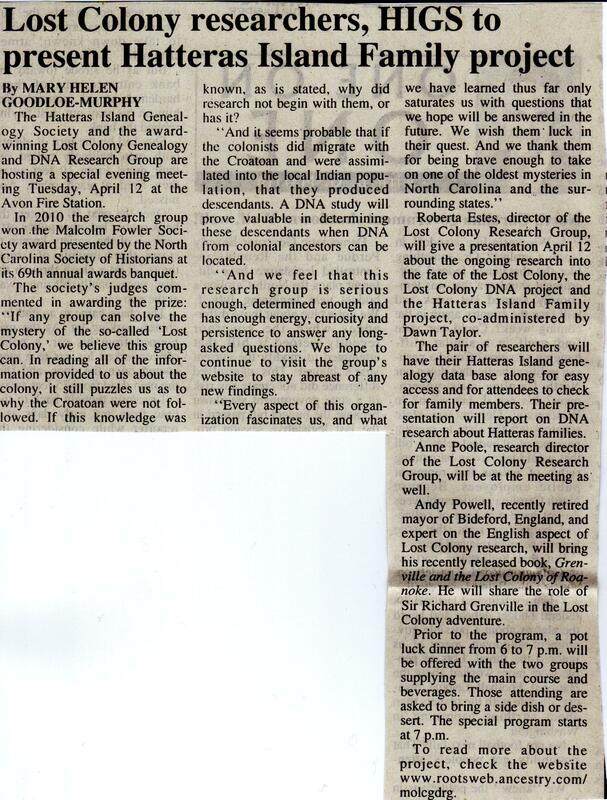 Hatteras Island Genealogy Society and the Lost Colony Genealogy and DNA Research Group, are coming together to bring you some good eats and we will have with us several guests, all specialists in aspects of Lost Colony Research. Roberta Estes, Director of the Lost Colony Research Group will give a presentation about the ongoing research into the fate of the Lost Colony, the Lost Colony DNA project, and the Hatteras Island Family …project, co-administered by Dawn Taylor. Dawn and Roberta will have their Hatteras Island genealogy data base along for easy access this evening, so be sure to see if your ancestor is listed. We’ll be talking about what we’ve found in the Hatteras families, genetically, too – so if it’s results you’re looking for – you won’t want to miss this. Anne Poole, Research Director of the Lost Colony Research Group will be with us as well. Andy Powell, recently retired Mayor of Bideford England, and expert on the English aspect of Lost Colony research will bring his recently released book, Grenville and The Lost Colony of Roanoke, and will be sharing with us the role of Sir Richard Grenville in the Lost Colony adventure. Andy has spent years translating original English documents and will be sharing his knowledge with us. Prior to our special guest speakers, there will be a pot luck dinner.